The parents of these kids usually point me in the direction of Birmingham or Atlanta. “There’s a place,” they say, “in Pensacola that is pretty good.” Admittedly I have not gotten the travel bug enough to go on a quest for the cuisine of the Philippines but my interest in the food was always there. So here we are in 2016 and Mobile has the first (that I am aware of) Filipino restaurant! Located on Old Shell Road behind The Holiday in the former Shamrock, Rose and Thistle/The House location, Ang Bahay Kubo-The Nipa House is breaking new ground, figuratively speaking. This lunch and dinner spot is still in the semi-early stages but the place looks better than ever. I must warn you that I normally wait for a restaurant to be open a little longer before I swoop in for a review, but my desire to try Filipino food forced me to throw caution to the wind as I called up the two bosses for a quick and easy lunch date. 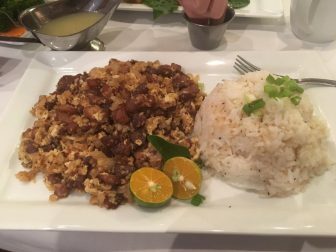 (Photo | Yelp) Dishes such as sigsig (left), a mix of diced pork, onions and chili peppers demonstrate the global influence of Filipino cuisine. Ashley and Rob showed up on my doorstep at 11:30 a.m. on an unseasonably warm Friday. We made the short drive listening to satellite radio and discussing the idea of a cuisine about which we each knew nothing. Rob pondered the Spanish influence as Ashley and I openly called him a nerd when we reached our destination. There actually is a Spanish influence to their style of cooking. But that’s not all. Yes, Magellan made his way over to the Philippines in the 16th century and trade began with the rest of the world. Of course the Asian influence is really present, especially from the Chinese. If you do a little searching you will find that trade routes also brought an influence from Thailand and Indonesia. Later on the islands would even be influenced by culinary advancements from Mexico and the Americas. So my little Filipino friends were right to show me their puzzled looks when asked about the food their mothers and grandmothers cook for them. 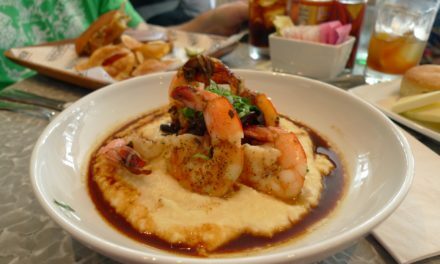 If there is a style of cuisine that is fusion (pardon the “f” word) or a melting pot of styles then this is it. Entering the familiar building we noticed a chalkboard with their Tagalog Word of the Day. I can’t remember the word to save my life, but one look at their Facebook page and you’ll find plenty of examples such as Salamat (thank you). 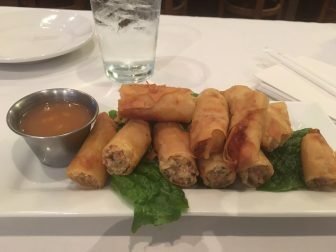 (Photo | Yelp) Dishes such as lumpia, demonstrate the global influence of Filipino cuisine. A couple of waters and an unsweet tea later our waitress was steering us in the direction of appetizers and entrees that were the best examples of authentic native cuisine. We began as she suggested without hesitation with Lumpia ($7.90) which are definitely a Chinese influenced item. These smallish crispy eggrolls were chopped into bite-sized pieces and served with a sweet and sour sauce. Filled with pork and veggies, they tasted familiar yet slightly different and kind of reminded me of Vietnamese eggrolls which were delicious. Kubo pork bbq ($12.50) caught the attention of Rob. I have to say his dish was exceptional. The pork is marinated and basted in a Filipino style sauce that is sweet and a little vinegary at the same time. This sauce should be bottled. The meat was a little tough but got better with every bite. Maybe it’s intended to be that way. With a choice of two sides Rob was in high cotton as the garlic rice was well done and the salad came with extraordinary and different tasting balsamic vinaigrette. I was gingerly guided towards the Sigsig ($12.98). This was a mix of diced pork, onions and chili peppers with a pungent aroma that went well with my rice and mixed vegetables of zucchini and carrots. Altogether it made for an oddly good mock paella/jambalaya that is not at all hot by most Asian standards. It was plentiful and good enough that I had to take the leftovers home. For kicks I also ordered an extra side of fried okra ($2). Served in a neat little stand with a side of what I guess is ranch from the hidden valley of the Philippines I wasn’t sure why this was on the menu, but I was glad it was. It was just classic fried okra. The boss lady Ashley nabbed what was my favorite dish in the Bicol Express ($15.50). You can see a touch of Thai influence or perhaps Indian in this one as shrimp is cooked in “spicy” coconut milk. It also went well with the rice and mixed vegetables but between the three of us tasting each other’s food there was nothing left to take home. I’ve learned that Filipino food is not very spicy like some other Asian styles. It’s almost refreshing to find it this way. 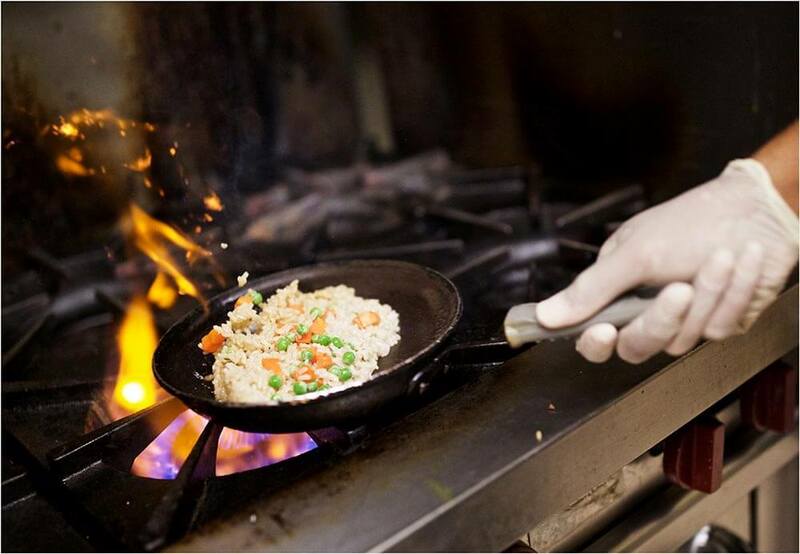 The focus is on the flavor, and of course anyone can add heat. Yes, it’s hard to put your finger on what makes it indigenous to that particular country but I would try to describe it as heavy on the pork with a tropical and slight Spanish tilt to it. Ang Bahay Cubo may be our first Filipino restaurant but I hope it won’t be our last. I have one word for it: Masarap (delicious)!